Treadmills are one of the most commonly purchased types of home exercise equipment, according to the American Council on Exercise. The versatility of a treadmill allows users of varying fitness levels to effectively incorporate treadmill workouts into a well-rounded fitness routine. A space-saving treadmill that folds up when you're not using it can be a good option for at home since you can easily store it out of the way. Before using it though, you'll have to know how to unfold it, fold it back up and operate it properly. Move your treadmill carefully out into an open space, where there's plenty of room to unfold it and use it safely. Locate the latch or pin that holds your treadmill folded and locked into place. It's usually found on the underside of the treadmill frame or near the end of the frame, on one side or the other. Hold the frame firmly in place with one hand to prevent it from falling, which could injure you and harm the treadmill or your floor. Use your free hand to pull the latch knob or pin to release the frame from being locked in place. Pull the frame slowly down to the floor, using both hands to support the weight of the frame. 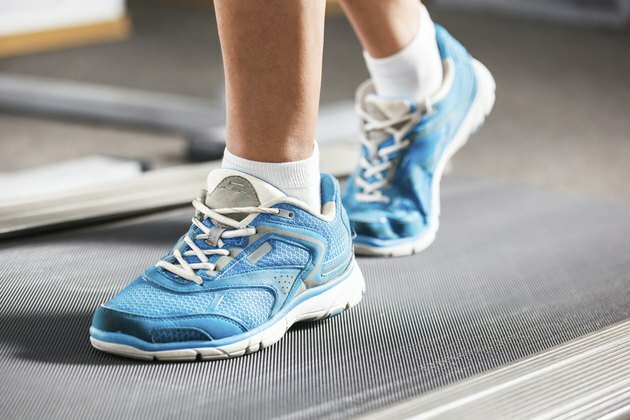 Gently lower the frame when you're unfolding your treadmill and never drop it on the ground. Always refer to your specific treadmill model's user manual before using your treadmill, for your safety. How Do You Lubricate A Treadmill Belt?